If you are in the market for laser cut sheet products, we would like to be your partner for a profitable future. SEF, Inc. is a custom shop and can supply you with everything from blank stock on bond or carbonless paper with or without perfing with up to 5 PMS® colors and both Arabic and MICR numbering. We have many customers that use bond or carbonless paper with back printing only for their products, which will be printed on the face by their customers laser printer. 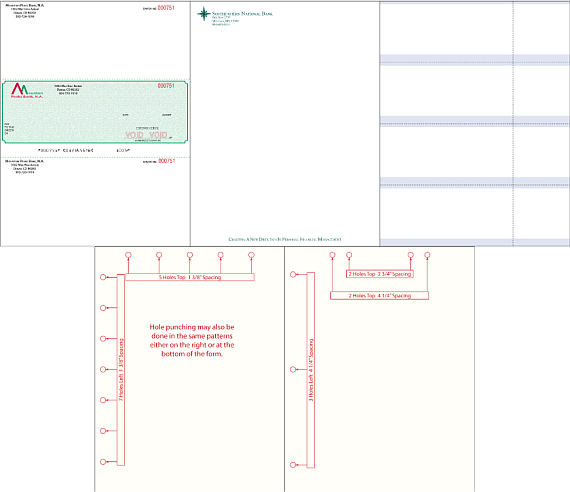 We can provide your customer with checks, DDA statements, invoices or any other laser cut sheet product you need. Custom punching is available as well as hole punching with standard spacing or custom punching. (See image at top of page for the standard patterns available.) We also provide folding for your laser cut sheet product if needed. Our typical turn around time is 3 to 5 days. Contact our customer service department at 800.633.1228 for more information and a quote. CLICK HERE for more information of the different types of business forms.